This article will help you distinguish between some of the different types of toothpaste to help you choose the best one for you and your family. For parents, the search for the safest products is an important responsibility. From shampoos and soaps to toothpaste and mouthwash, you’ll want to keep your kids safe by choosing the best products. Most parents are not aware that the bubble gum or candy-flavored toothpaste marketed to children may contain potentially toxic ingredients. These include fluoride, which can be toxic if large amounts are swallowed, sodium lauryl sulfate (SLS) and saccharin, among others. Toothpaste without SLS presents many benefits, which can help you avoid exposing your family to toxins and harsh chemicals. When in search of the safest dental care, this may be the best option. In the quest for the safest toothpaste, many parents wonder why they should choose toothpaste without SLS. Sodium lauryl sulfate, or SLS, is found in most common personal care products. Functioning primarily as a surfactant ingredient, SLS is found in soap, shampoo, lotion, and many other products your children are likely to use. Although some people can use these products with no immediate adverse reactions, SLS is linked to allergies and sensitivities, as well as potentially causing canker sore flare-ups and drying the mouth. Sodium lauryl sulfate is a detergent and used also for its foaming properties. In addition to its uses in personal care products, SLS is also a common ingredient in industrial cleaners, engine degreasers, and other chemical-rich products. Studies report SLS in toothpaste can lead to canker sores, mouth ulcers, and other risks. In order to protect your family from the hidden dangers found in commonly used products, it’s essential to become aware of the harmful ingredients to avoid. SLS free toothpaste is one of the many solutions to keep your family safe with smart product choices.By using SLS free toothpaste you decrease the risk of exposing your family to potential toxins and sensitivities. With prolonged use, sodium lauryl sulfate has been shown to irritate the skin of the face and worsen skin problems in those who have skin sensitivity. A preliminary study reported SLS in toothpaste caused recurrence of canker sores. This report also showed a decrease in canker sores after brushing with SLS free toothpaste. While other studies showed no difference in canker sores, other studies indicate concerns with SLS containing toothpaste. Since these studies are inconclusive, it may be safer to use a SLS free toothpaste. A study published by Michael Adams, in Characteristics and Measurement of Flavor Compounds showed that it can even cause temporary taste alteration. Typically triggered by hot, cold, sour, or sweet foods and drinks, tooth sensitivity causes much discomfort. In your search for effective treatment options, the right toothpaste is one of the most essential elements to finding success. With the right toothpaste you will be able to enjoy the foods you love most without worry of triggering pain or discomfort. No matter what the cause, you’ll need to find effective treatment options in order to avoid the pain and discomfort caused by sensitive teeth. Visit your dentist to determine if the cause is tooth decay or gum disease. 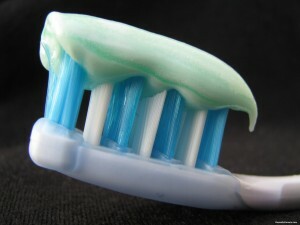 For decades, fluoride has been one of the most common ingredients in toothpaste. Its supposed efficacy in the prevention of tooth decay made it a common part of the production of dental care products worldwide. What most people fail to realize is that fluoride is highly toxic if swallowed in large amounts. Children are at most risk, while being tempted to swallow the almost candy tasting children’s fluoride toothpaste. Recent research are reporting breakthrough results with tooth decay prevention with xylitol. Xylitol is tolerated by diabetics, is harmless if swallowed and helps with dry mouth. Fluoride free toothpaste has become a popular product option for consumers in search of safe and effective dental care solutions. Is Fluoride Free Toothpaste Safe for the Entire Family? When compared with traditional fluoride toothpaste, which often comes with warnings about excessive exposure to or ingestion of fluoride, fluoride free toothpaste contains safer, gentler ingredients. These ingredients are not only safe enough for the whole family, but also safe if accidentally swallowed with no adverse reactions. By choosing products free of these harsh chemicals, you can have peace of mind that everyone in the family can safely use these natural dental care essentials. The connection between heart health and oral health has advanced and shown to be relevant. Natural toothpaste can make an impact on your overall health, including heart health. However, not all natural toothpastes are the same. A healthy oral environment can help lessen the risk of stroke, heart disease, respiratory disorders and even problem pregnancy. You might think just because a toothpaste is labeled “natural” it must be effective. In order for toothpaste to help bring about healthy teeth and gums, it should help neutralize the overall pH of your mouth, therefore, preventing acid from destroying tooth structure and bringing about accumulation of plaque. Plaque is the film that builds on your teeth which contains harmful bacteria. The bacteria love and thrive in an acidic environment. Saliva tends to help balance the pH and bring about a neutral pH of your mouth. It’s therefore, important that your toothpaste also help bring about a neutral, acid free oral environment. Instead of choosing a natural toothpaste, look for an SLS free toothpaste. Baking soda toothpaste can also help promote a neutral pH. Look for this type of toothpaste as well. Alcohol in mouthwash is another ingredient that may dry the tissues of the mouth. If you need to use mouthwash, use an alcohol free mouthwash. Xylitol toothpaste is another great ingredient for healthy gums and teeth, because it helps promote flow of saliva. The right oral care products used daily can help bring about a healthy, beautiful smile, and help decrease the risk of heart disease. The natural products market has become a popular choice for consumers everywhere. From organic foods to chemical-free cleaning products, you can go green in all areas of your life. Choosing natural, safe personal care products will give you peace of mind that your family will be exposed to only the safest ingredients. All natural toothpaste with safe ingredients is an ideal way of maximizing dental health without the dangers that come with harsh, abrasive chemicals found in conventional dental care products.